Home » Updates >> Our 23rd & 24th Containers Off To Angola! Our 23rd & 24th Containers Off To Angola! 2016 has seen another 2 shipping containers full of Ready-to-Use Therapeutic Food (RUTF) sent off on their way to more children in need. This time, Angola is the receiving country for our RUTF packages. These 2 containers are aboard the vessel, JONA 08579S and heading for the port city of Lobito, due February 2nd, 2016. 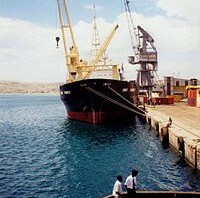 This port city is located on the south-central coast of the province of Angola, in the province of Benguela. It is a city adorned with a wide bay, with the Port of Lobito, and a magnificent tongue of land which penetrates the sea – the famous Restinga ex-libris of the city, which hosts the famous Carnival of Lobito. 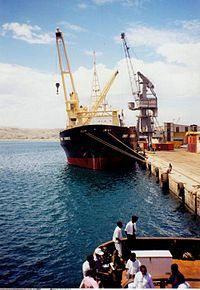 Categorized as “international first class seaport”, with its mineral pier recently expanded and modernized, it is in line with the Benguela Railway, for flow of goods into the interior of Angola and neighboring countries – particularly the Democratic Republic of Congo and Zambia, which need it mainly for export of its minerals. Track our shipment LIVE here as it makes its journey to Angola. Want to learn more about how we are helping save the lives of malnourished children in Africa? Watch the video about a little boy named Miracle. You can see how a simple, nutritionally packed peanut paste helped save his life and hundreds of others!